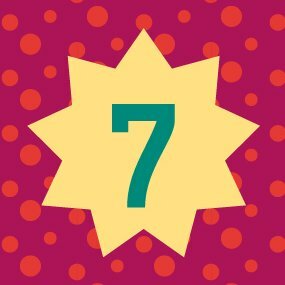 Before learning skip counting by sevens, be sure your child is well acquainted with counting by the previous numbers. Reinforce earlier lesson skills by chanting them out loud with your student. Time during a car ride can be spent practicing skip counting as well. Learn to work these "mini reviews" in casually and without pressure. Multiplication seems to be something that many pupils struggle with. 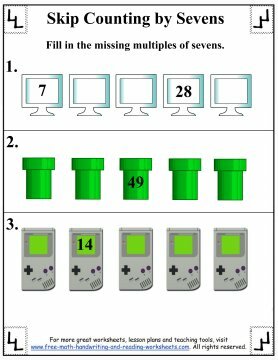 If you can strive to make memorization of the basic multiplication tables more fun, most children can learn them without a problem. Although it's tempting to simply hand the printed worksheet to the student and tell her to fill it out . . . it becomes more meaningful if she is allowed to cut and paste at the same time. The more time spent on the activity, the more likely she'll remember the numbers. 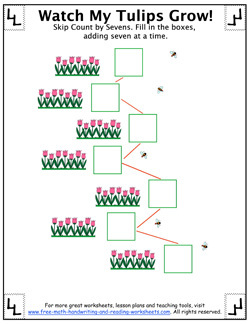 Download the 1st page below and have the child cut out each individual tulip row (including the empty box). Have your child then paste each strip on brown construction paper (representing her "garden"). While the glue is drying, spend some time having her count each individual row out loud, which will impress the fact that each row contains seven tulips. Now have her start at the beginning again - this time pausing to count up to 7 and write "7" in the first blank box. Have the student continue to count the second row of tulips until she reaches 14 - and then write "14" in the box. Continue until all the boxes have been filled in. 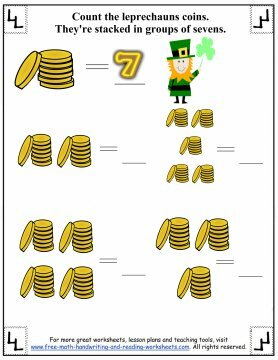 In the second worksheet there are stacks of gold coins. Each stack has seven gold coins in it. Count the stacks and then write the number of coins on the line. Have your child double-check her work by counting the coins individually. In the third worksheet there are three rows of items. Fill in the missing numbers by counting up or down by sevens.